Mika Hakkinen was an endearing character: a cool and calm Finn taking the fight to Michael Schumacher and the resurgent Ferrari of the late nineties. The double world champion's career reads slightly like a movie script, as he battled back from a life threatening injury to claim his titles. 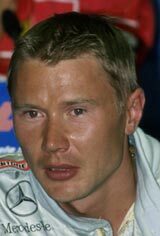 Hakkinen first drove a go-kart at the age of five, and promptly had an accident on his very first lap. Undeterred, he continued in karts and by the time he was 18 he had won five karting championships. He then progressed through single-seater ranks, winning the 1990 British Formula Three title. It was also in 1990 that he had his first encounter of note with Schumacher. In the Macau Grand Prix he was running in second place behind the German, a position that would be enough to give him an aggregate race win. However, he tried passing Schumacher, and the pair touched, putting Hakkinen out of the race. The disappointment didn't hamper him though, as he made his Formula One debut the following year. Hakkinen's name became almost synonymous with McLaren, but it was with Lotus that he started his Formula One career, having a strong performance at the first race of 1991 in Phoenix before his engine failed. Points followed in Hakkinen's third race, when he came in fifth in Imola, but it was to be his only scoring finish of the year as mechanical issues plagued him. The following season was a similar story, and Hakkinen retired from more than a third of his races with Lotus, leading to the switch to McLaren in 1993. He had to wait for his chance to step up from test driver with the team, but took it with both hands when it came: out-qualifying his three-time world champion team-mate Ayrton Senna on his debut in Portugal. A podium at the following race in Suzuka secured him a race seat for the following year, and with Senna leaving for Williams, Hakkinen became lead driver. Plenty more podiums followed but that first win proved elusive, and looked like it may never come when he crashed in practice at Adelaide in 1995. Emergency treatment on the track saved his life, and he was back in the car for the start of the following season. A strong two years followed, with his first win finally secured at Jerez in 1997. That win opened the floodgates for Hakkinen. He won the 1998 season-opener at Melbourne, one of eight victories that year as he held off the challenge of Michael Schumacher to be crowned champion at the final round in Japan. Schumacher was sidelined by a broken leg sustained at Silverstone the following season, leaving Eddie Irvine as the closest challenger. Hakkinen's McLaren was less reliable during the 1999 campaign, and the pressure of the title battle was displayed at Monza when he broke down in tears trackside having spun out of the lead. Again the season went down to the final race, and victory in Japan meant five wins were enough for him to make it back-to-back titles. However, Schumacher returned to win the championship in 2000 as Ferrari started a period of dominance, and after only two wins in 2001 Hakkinen left the sport. His ice-cool exterior marked him out as one of the most consistent drivers on the circuit. However it hid an emotional man underneath who was more prone to errors under pressure. Beating Schumacher to his first title at the final round of the season with a comprehensive victory in Japan in 1998. Suffering a puncture in practice in Adelaide in 1995, causing him to crash heavily with only an emergency tracheotomy saving his life. "I've been through so much in my career in F1, particularly in 1995, and I did achieve so much that I thought it's not worth it any more to push your luck further." "Formula One is a mind game, no question. You have to think so hard sometimes smoke comes out your ears! And if you don't keep your head in gear the car will overtake you"
He can ride a unicycle, and showed off his skills on stage in 1998, performing in a circus in Munich to raise money for starving children.